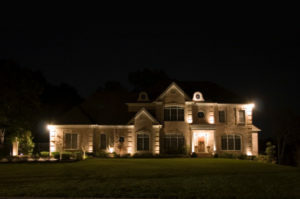 Cambridge homeowners choose to install outdoor lighting for numerous reasons. One homeowner may hire an electrician to install outdoor lighting to increase safety and security along pathways, and another may decide to purchase outdoor lighting to highlight their landscaping when the sun sets. Regardless of your reason for installing outdoor lighting, you’ll need to determine a type of lighting, design, bulb wattage, and location. Which Type of Outdoor Lighting Should You Choose? Security or Flood Lights – If the security of your household is one of your top priorities, then hiring an electrician to install security and flood lighting is an excellent investment. Security and flood lights are broad-beamed lights with a high intensity, and they illuminate large areas. Some of these lights are paired with motion sensors to brighten areas when movement is detected. Other security lights are operated manually with a switch. Dusk-to-dawn lights turn on when the sun sets and turn off when the sun rises. When selecting security lights, make sure to choose a high wattage bulb that doesn’t cast deep shadows or illuminate beyond its designated area. Smart security light options include features such as wireless setup, camera connections, and app control. Ceiling or Pendant Lights – Outdoor hanging ceiling-mount or pendant lights are typically installed on gazebos, porches, and entryways. Ceiling and pendant lights are especially popular near outdoor dining and seating areas. Step Lights – You may choose to install outdoor lighting because you want to increase the safety of your stairways and walkways. Your electrician can install LED step or path lights to increase visibility. These LED lights are designed as tubes or short configurations that function well on steps and walkways. Wall Lights – Wall lights are often installed near walkways, stairways, and recessed areas, and they’re selected because of their ability to remove shadows and decrease the risk of trip hazards. The light is directed downward, illuminating the walkway and landscaping below. They also serve as decorative accents on exterior walls because the panels that cover them can be customized to homeowners’ tastes. Wall lights work best with soft, low-wattage bulbs. Post Lights – If you want a type of lighting with some personality, post lights may be for you. Post lights are mounted to posts, railings, or other poles at various heights, and homeowners can choose from many intricate designs and finishes. Post lights are commonly used near driveways. Once you’ve decided which type of lighting to install on your Cambridge home’s patio, walkway, steps, or driveway, contact an electrician at MacEwan Electric, and improve your residential property’s security and safety.